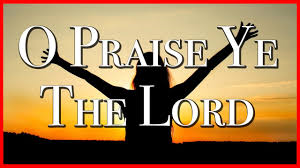 Today, as we look at Psalm 113, we are looking at Praise. I want to talk about this emotion of praise by asking two questions. First, HOW do we praise God? Second, WHY should we praise God? To “Praise” God simply means to declare the greatness of God. And what comes to mind for me is that there are many ways to do that. We praise the Lord with our voices, to be sure – in our worship, in our singing, and in our prayers. We praise the Lord when we tell someone how great God is, or when we share with others the story of God’s gracious love in our lives, telling others what God has done for us. And we even praise God with our actions, don’t we? Our participation in God’s mission – the quilts and the World Relief projects that we send all around the world – is this not also praising God? Serving others, loving others, doing the things that God has given us to do, is this not also declaring the greatness of God? There are many ways to praise the Lord! I like to go on walks and focus my mind and my spirit on praising God for all he has done, is doing, and has promised to do. There are times that Nadine and I are in the car, like on vacation, and we might sing some hymn or song of praise to God. That’s another way of praising God. Other times I like to think of my praise of God as an intentional action of listening to others – to visit, to listen, to be with, and to value this other person whom God so deeply loves. I was listening on Tuesday night, at Trinity Lutheran church in Owatonna, to Mawein Arik, a pastor in South Sudan, supported by the Southeastern Minnesota Synod of our Church. There were about 30 people listening as he shared the challenges, frustrations and difficulties that he faces in as a Pastor in South Sudan, with all the poverty and violence in that country. We listened, we prayed, we encouraged him, we supported him. I gave a monetary offering to support God’s mission in South Sudan – another way to Praise God, to value and support the things that God is doing. And then, we turn our attention to the second question: Why should we praise God? I invite you to take out your worship bulletin and find Psalm 113. I’m going to ask you to read two portions of this Psalm with me. This Psalm tells us that we should praise God because of who God is and what God does. Note that God is described as “seated on high.” What does that mean? In the ancient world, when this Psalm was written, there was a culture of many gods. Every nation had its own god. And these gods were powerful and lived up in the sky or on mountains. Baal was the god of Canaan, Chemosh the god of Moab, Dagon the god of the Philistines, Marduk the god of Babylon – and on and on for each country. Life was all about, “My god can beat up your god.” Psalm 113 reminds us that the one true God is above all that pettiness. God is the creator and giver of life. God is over all, and above all. And God can be trusted. Think about this: When humans are high and exalted, when humans are given a whole lot of power and authority, what do they usually do with it? Well, often – not always, but often – power goes to people’s heads, right? Instead of power being used to benefit others, it becomes power being used for personal gain. In this negative side of power, the more people possess power, the more they focus on their own selfish gain, and the less able they are to see others’ perspectives. We’ve seen this when there have been dictators in parts of the world. There is less compassion, les concern, on the part of the leaders for those who suffer poverty or injustice. But, what does God do? Notice the verbs describing God’s actions. “He raises…he lifts…he gives.” Those are the kind of actions that can only be done in person, hand’s on. And here is the picture of God in the Bible: the one who is above everything, the one who holds all power and authority, steps down, and comes near, and loves and helps and comforts – who? The poor, the needy, and the barren. If you were one of those things back in that time, you were considered less, unworthy, of no value, unloved by God. You were treated like garbage – only good for the ash heap. But God levels the playing field. This was most clearly expressed through Jesus. In our gospel reading (Mark 6:30-34, 53-56), we see Jesus showing compassion to the crowds that followed him. These were the poor, the sick, the needy – those considered less, considered of no value or worth, considered unloved by God. But God sent his Son to show his love for each one, and to call us to see each other as equals in the eyes of God and to love one another. “Then,” as Bible scholar Walter Brueggemann writes, “we bear witness to another world.” A world where no one is excluded; a world where people are not lower or less or forgotten; a world where all are embraced with compassion, concern, and love. Acknowledging God for who he is and what he does. That is praise. Here’s my simple challenge for us this week. First, take time each day to bring the image of this Psalm back into your mind. The God who is up there, comes down here, to set us free and to set the world free, from all that oppressive mindset of people being lower or less or forgotten in God’s eyes. God cares about the poor and the needy and the forgotten. Second, as you go through the day, try to find ways that you see the evidence of God at work. It could be as simple as an act of compassion – one individual helping another. Or it could be something as big and deep as someone fighting for social justice to bring a voice to the forgotten or oppressed. And third, think about how you might show forth your praise for God, not only with your voice, but also with your actions, by giving yourself in service to those in need, just as is spoken of in this Psalm. In this way, we value what God values – compassion for the least. And in aligning our values with God’s values, our lives give him praise!